"The garden outside the apartment was nice too." Have a question for Zerof Self Catering Apartment? "The apartments are comfortable and clean." "Overall, we liked the quiet and peaceful stay, giving an exp..."
Zerof Self Catering Apartment, located in La Digue Island, Seychelles Islands, is a popular choice for travelers. From here, guests can enjoy easy access to all that the lively city has to offer. This modern hotel is in the vicinity of popular city attractions such as Veuve Reserve Information Centre, Azzura Pro-Dive, Mason's Travel. Zerof Self Catering Apartment also offers many facilities to enrich your stay in Seychelles Islands. Guests of the hotel can enjoy on-site features like ticket service, gift/souvenir shop, daily housekeeping, grocery deliveries, luggage storage. Step into one of 5 inviting rooms and escape the stresses of the day with a wide range of amenities such as non smoking rooms, air conditioning, wake-up service, mini bar, balcony/terrace which can be found in some rooms. Besides, the hotel's host of recreational offerings ensures you have plenty to do during your stay. Whatever your purpose of visit, Zerof Self Catering Apartment is an excellent choice for your stay in Seychelles Islands. 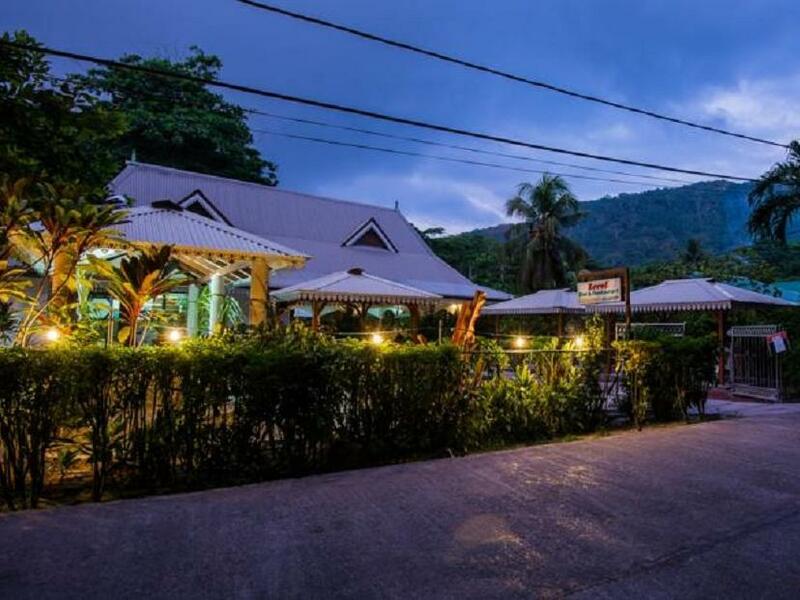 "The creole buffet was excellent, the morning fruit plate was..."
Ended up staying in the guest house, it was ideal for a short stay, still family run with few staff from overseas, unlike the other larger establishments on La Digue. The creole buffet was excellent, the morning fruit plate was amazing, with toast to follow. Whilst others have criticised there being no cooked breakfast, I feel the fruit was an excellent replacement and a very refreshing start to the day. We stayed at the self catering apartment. It was well maintained. The utensils needed for cooking were available. They offered a pickup and drop to the ferry point. The garden outside the apartment was nice too. There were washing machines to help wash clothes too. This island is for those who wish to dial back a little in time, to experience a rustic lifestyle: mud roads outside the apartment, leading to the main road, bicycles for getting around the island, and the peace from cutting ourselves off from internet connectivity. A super market was reachable by a short bicycle ride, where we could get essential items. It rained nearly every day during our stay there. This limited the time for which we could be outdoors during the day, using bicycles to get around the island. But, it's an experience to cherish. Overall, we liked the quiet and peaceful stay, giving an experience of dialing back in time! Cheers! Very friendly staff. They pick you up at the jetty for free. They can arrange excursions or rent bikes for you. The apartments are comfortable and clean. Very convinent. They offer a discount to guests at the restaurant. Self catering apartments are in different place than Zerof guesthouse/restaurant almost 2 km!! If you need something there is no one to ask. Apartment doesnt have living area, just kitchen with dinning table and seperate bedroom. No tv , no radio, no telephone, no wifi. Also one day there was No Water! And problems with electricity! You can have light only in one room at a time!! I found local people quite arrogant and strict, there is no happy or relaxed feel in this island. (La Digue) We stayed 5 days, it was too much, the island is small. We really enjoyed our stay. One of the owners graciously provided aloe vera several times for my skin problem. The apartment is very spacious and quiet. All in all, great value for money. Our stay there was above expectations. Good things were that they also had a supermarket and restaurant in the guest house, both were relatively big, but dinner was fixed menu. Nice rooms, near to center of island, friendly staff. I recommend this hotel, the rooms were very nice clean and comfortable. The location was good, near to center of the island and restaurants. Not so far from the beach. The owner was helpful. In the same building was a shop with food and souveniers. The only thing I dislike was poor breakfast. Only toasts with jam and fruits. Very friendly staff. It is good to send ifnromation about your arrival, as the owner sent her father to the jetty to pick-up us. It is good option as few rooms are not located exactly where all signs show it is. Nevertheless the locations is still convenient. I found Guest house reading the reviews. There were positive so I booked a room for 4 nights. The room as clean, but the bathroom shower in was in bad shape. Service can try to be polite, but all actions are carried out slowly, I had the impression that they ignore me.Breakfast is very poor. For four days, two slices of watermelon, 2 small bananas, a small strip of avocado, two slices of pineapple from a can, one and a half a piece of toast, a little jam and butter. For this glass of juice and coffee. And so for three days, the last day I got two thin slices of cheese.After coming to breakfast we had to wait 15 minutes until someone notices that we came. Dining medium, you have to check the price of the menu or agrees with this account.There is bike rental, bike heavily exploited.I think that for this price you can find a better place to stay with a much better breakfast, service and standard. There is also a take-away food, after the poor breakfasts you can buy something on the spot. Downstairs there is also a mini market. As if improved handling and gave richer breakfast it would be much better. Cheap, Shop downstairs, Bicycle rental. Low water pressure in bathroom can be a problem for someone. Hemos disfrutado mas de lo que esperábamos, con un servicio bueno y agradable, seguro que volveremos !!! Es un apartamento muy espacioso, con cocina-comedor, habitación y baño grande. Todo esta muy limpio y en buenas condiciones. El personal es muy atento y agradable. La zona está un poco alejada, pero hay mucha tranquilidad. Además tienen un guardia vigilando por la noche. Calidad precio está muy bien. Nosotros reservamos para 2 noches y al final estuvimos 3 noches más. El bungalow era simple pero correcto, tienen traslado al jetty incluido. Tal vez como contra el que no cambiaran las toallas a no ser que se lo pidieras.